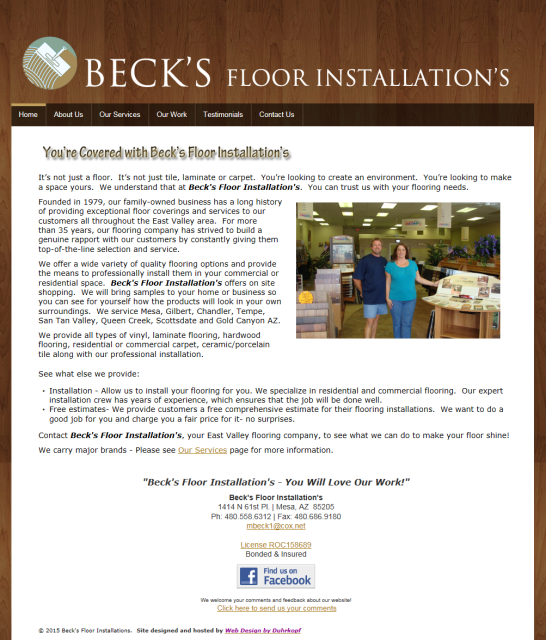 Take a look around at the work that we've done for others. 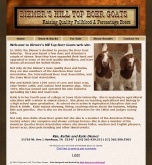 Click on the links below each site to view their entire web site. At Web Design by Duhrkopf, you not only get your web site designed, developed and published to the Internet, but you also get the capabilities of making any futures changes on your own! With the purchase of your package, you will have access to the site builder tools necessary to make any further modifications, add/remove items from your e-commerce store, or update anything else that comes along. Of course, we're here to help with those processes if you don't want to tackle them on your own. 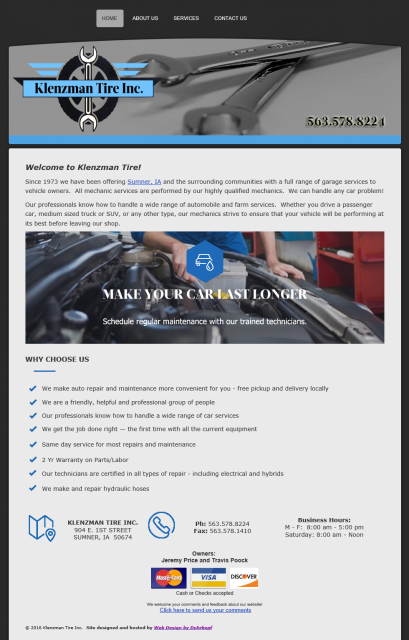 Because of this unique feature that our clients can maintain their own site, once a site in completed, the result may be that the original design from the time of Web site launch may have been modified. 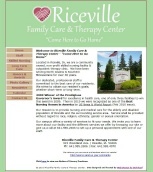 Welcome to Riceville Family Care & Therapy Center - "Come Home to Go Home"
Located in Riceville, IA, we are a community owned, non-profit skilled nursing facility & outpatient therapy clinic. 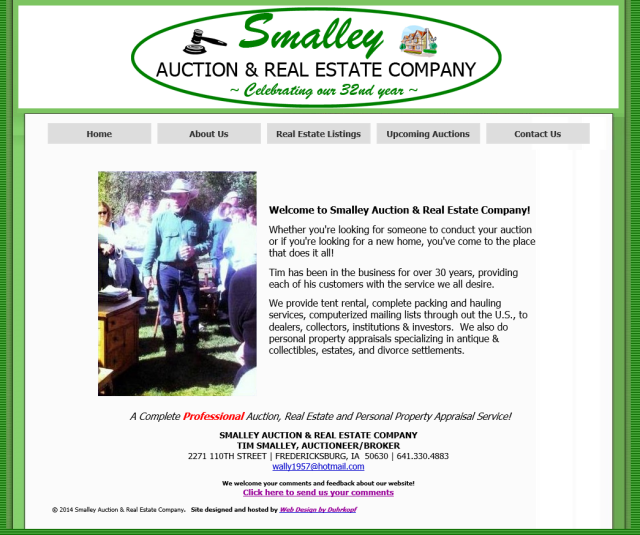 We have been service North Iowans & Southern Minnesotans for over 30 years. 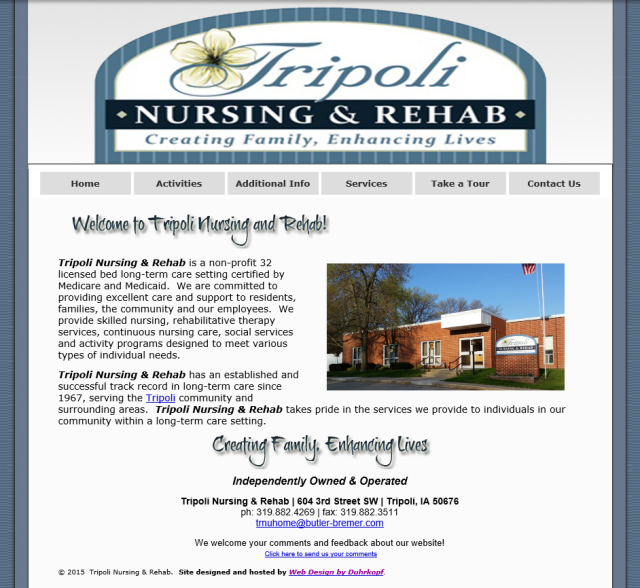 Welcome to Tripoli Nursing and Rehab! Tripoli Nursing & Rehab is a non-profit 32 licensed bed long-term care setting certified by Medicare and Medicaid. We are committed to providing excellent care and support to residents, families, the community and our employees. We provide skilled nursing, rehabilitative therapy services, continuous nursing care, social services and activity programs designed to meet various types of individual needs. 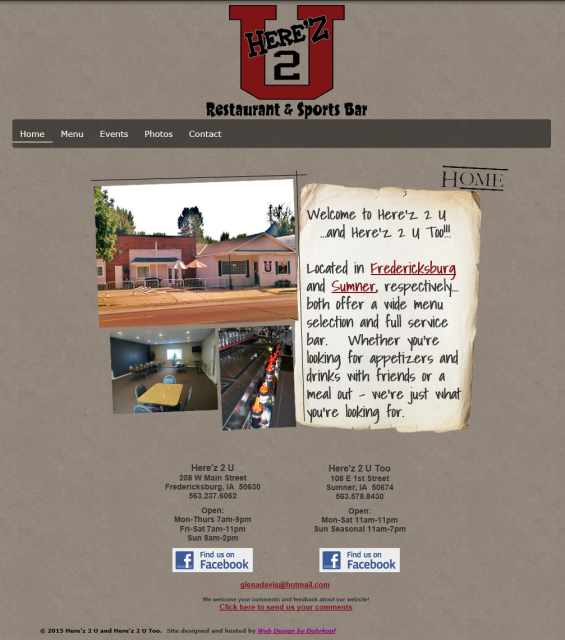 Welcome to Here'z 2 U... and Here'z 2 U Too!!! Located on the South shore of Eagle Lake, serving families for 75 years, we are a small family resort consisting of six rustic cabins and one trailer. Sumner is the best kept secret in Northeast Iowa. Nestled in Northeast Iowa, Sumner is located in Bremer, County along Highway 93. The community is conveniently located within an hour's drive of five colleges and universities. 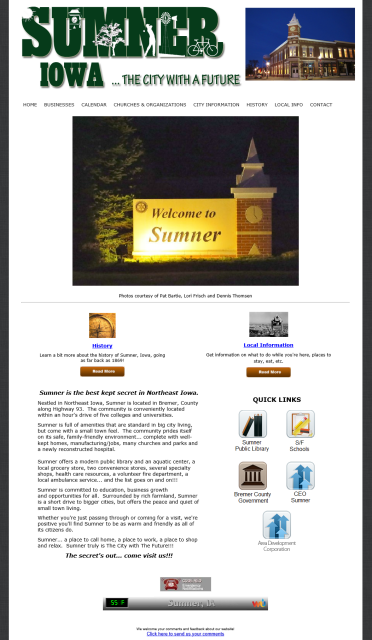 Sumner is full of amenities that are standard in big city living, but come with a small town feel. The community prides itself on its safe, family-friendly environment... complete with well-kept homes, manufacturing/jobs, many churches and parks and a newly reconstructed hospital. 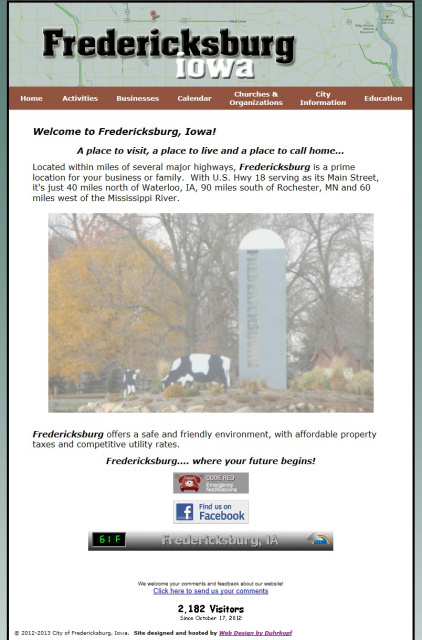 Located within miles of several major highways, Fredericksburg is a prime location for your business or family. With U.S. Hwy 18 serving as its Main Street, it's just 40 miles north of Waterloo, IA, 90 miles south of Rochester, MN and 60 miles west of the Mississippi River. 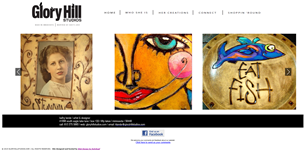 Glory Hill Studios - Delightful Works of Art - located in Fifty Lakes, MN. 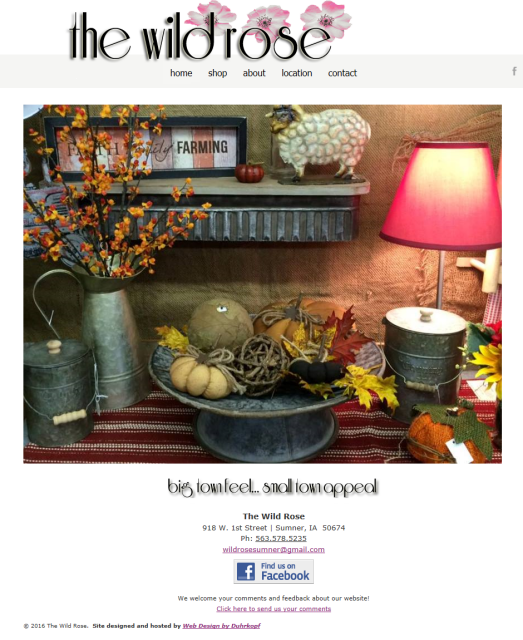 Glory Hill Studios offers a most stunning selection of special occasion gifts and truly unique home decor, along with a most delightful line of children's furniture. 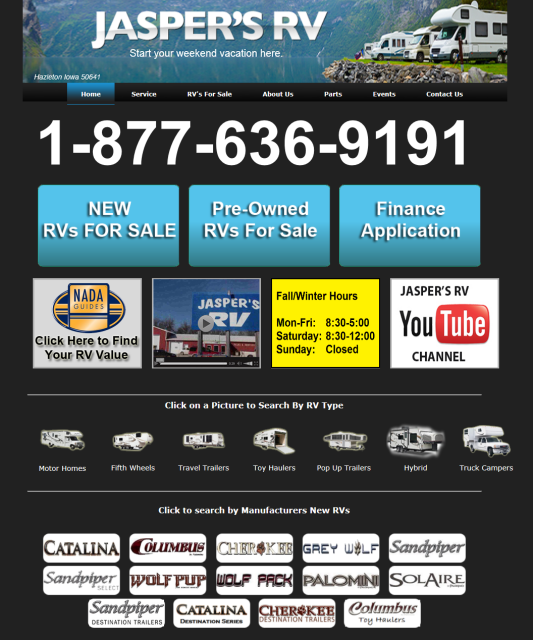 Jasper's RV - Start your Weekend Vacation Here! The Wild Rose proudly serves the Sumner and surrounding areas. Since 1945 the floral business has existed in this very same location in Sumner. Susan Heying, the current owner, took over the business in 1995 as The Wild Rose. 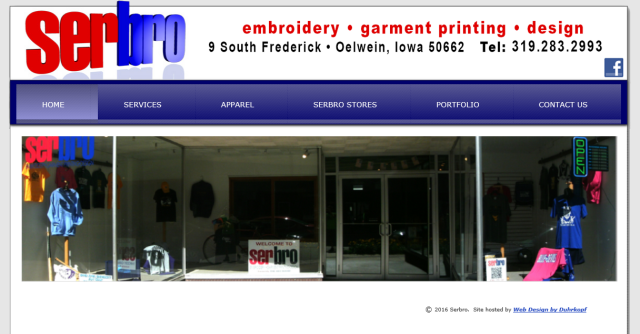 Geilenfeld Funeral Home celebrated 100 years in Oelwein in October of 2001. Henry and Albert Hintz started the Hintz Funeral Home and Furniture Store in the Hanson block of West Charles in 1901, coming from Albert Lea, MN to purchase a furniture and undertaking business. 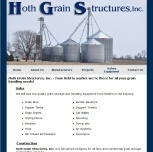 Hoth Grain Structures, Inc. - from field to market we're there for all your grain handling needs! 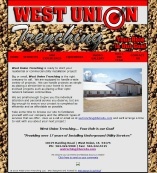 West Union Trenching is ready to start your residential or commercial utility installation project! The 9-hole Wapsie Ridge Golf Course was built during the “great flood” of 1993. Designed by Dan Niebuhr and constructed by his father Loren, Dan, brothers Kevin and Mike and with help from numerous friends & relatives. Battling year long rain and flooding in 1993, the entire construction process was still completed in less than 8 months! Play began in August 1994 and the clubhouse was also built that year. winner of Iowa's 2010 Best Government Recycling Program!! When Bremer County (Iowa) ended its county-wide recycling program in the fall of 2007, communities were left on their own to find operational alternatives. Representatives met in the spring of 2009 and it was concluded that the idea of working together to collect, process and market recyclable materials would more likely lead to success than each town doing it on their own. 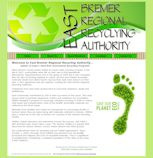 A 28-E agreement was put together creating the East Bremer Regional Recycling Authority. 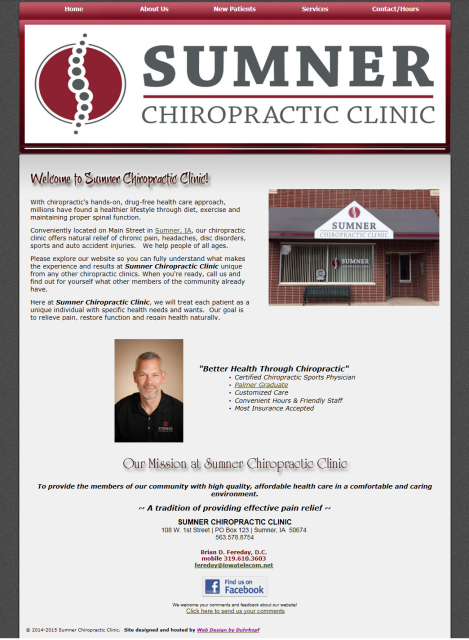 Welcome to Sumner Chiropractic Clinic! With chiropractic's hands-on, drug-free health care approach, millions have found a healthier lifestyle through diet, exercise and maintaining proper spinal function. Conveniently located on Main Street in Sumner, IA, our chiropractic clinic offers natural relief of chronic pain, headaches, disc disorders, sports and auto accident injuries. We help people of all ages. Since 1973 we have been offering Sumner, IA and the surrounding communities with a full range of garage services to vehicle owners. All mechanic services are performed by our highly qualified mechanics. We can handle any car problem! 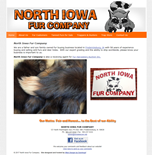 We are a father and son family-owned buying business located in Fredericksburg, IA with 58 years of experience buying and selling wild furs and deer hides. With our expert grading and the ability to ship worldwide, please know your business is important to us. 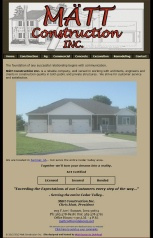 Nauholz Insurance Agency is in the business of helping people. We help our customers save money, we help businesses reduce risks and we help families protect and preserve their financial future! The value of human resources is frequently overlooked by employers. The reality is companies/businesses/organizations who are without HR are at risk of liability that can be avoided. 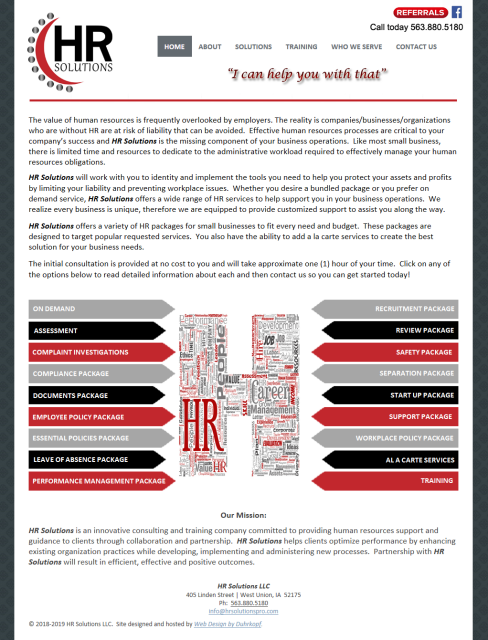 Effective human resources processes are critical to your company’s success and HR Solutions is the missing component of your business operations. Like most small business, there is limited time and resources to dedicate to the administrative workload required to effectively manage your human resources obligations.